The commander of Tajikistan's special police force, who disappeared in late April, has resurfaced in a Youtube video, where he said he had joined the Islamic State terrorist organization (IS, formerly known as ISIS, ISIL). 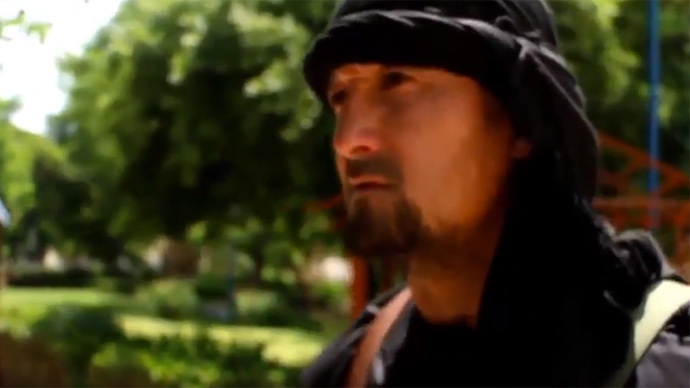 Colonel Gulmurod Khalimov is seen in the 12-minute video vowing to bring jihad to Tajikistan, Russia and the US. He is filmed sitting against a backdrop of palm trees, brandishing a gun and surrounded by bearded, armed men. It is unclear where he is. Forty-year-old Khalimov was the commander of Tajikistan's special police or OMON, used against militants in the Central Asian nation. Police have been searching for him since he vanished in late April. Hints as to where he had gone had surfaced before. "Since the start of the year Khalimov was obsessed with that 'Islamic State': he was reading about their ideology in the internet, he argued with his colleagues, saying they [IS] are in the right," Interfax quotes one of Khalimov's colleagues, who spoke on condition of anonymity. Khalimov said he had left Tajikistan because Muslim rights are being violated there. He claims men are not free to wear beards and women cannot put on headscarves. He says another 10 Tajikistan citizens left the country together with him, and called on his former colleagues to follow suit. During his career in the OMON, Khalimov took several training trips to Russia and the US. He said that in the US, he saw fighters being trained "to kill Muslims." Khalimov also condemned Tajiks working in Russia, calling them "slaves of infidels." Tajikistan police plan to issue a statement condemning Khalimov, according to several officers cited by the US-founded Radio Liberty. Tajik police say at least 300 of the country's citizens are abroad fighting for IS. At least 40 others have died while on the terrorists' side.